It would be fun to assemble an orchid collection consisting of plants with the species epithet medusa, all named for the winged monster of Greek mythology who had snakes for hair. In Habenaria medusa the epithet refers to the abundant and incredibly long lobes of the lip. Now that's a sweet little collection. 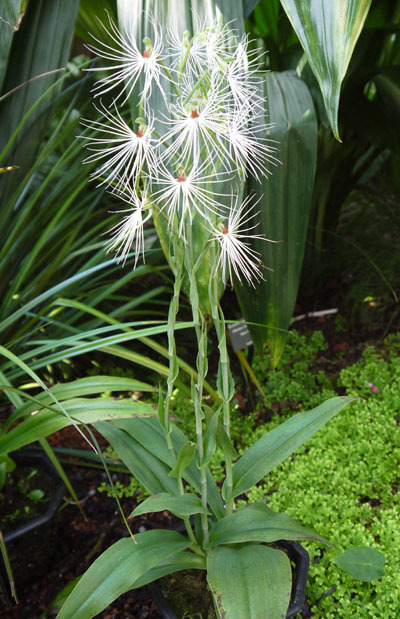 Okay, so maybe the Telipogon is out of reach, but Habenaria medusa is commercially available and easy to grow. It grows and flowers readily in a peat-based terrestrial mix in 80% shade and warm temperatures. In fall the leaves shrivel, signaling the onset of dormancy. During dormancy we water the still-potted tubers about every two weeks until we see new growth emerge. Easy. Find out more about this and other Habenaria species here. These are gorgeous! And I thought the Dracula orchids were fascinating.